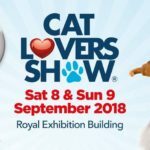 Cat Lovers Show & We’ll be there! We are excited to be a speaker at this event, this is your chance to see Didga and Boomer up close, maybe even get a picture and a quick pat. We are driving from the Gold Coast to Melbourne, no putting them on a plane, not until they can ride in the cabin with me.